Nobody loves you? Don’t have any fried worms to go and eat? Maybe you could try fried…slugs? Well, I’ve got the slugs for you — except they aren’t slugs at all! 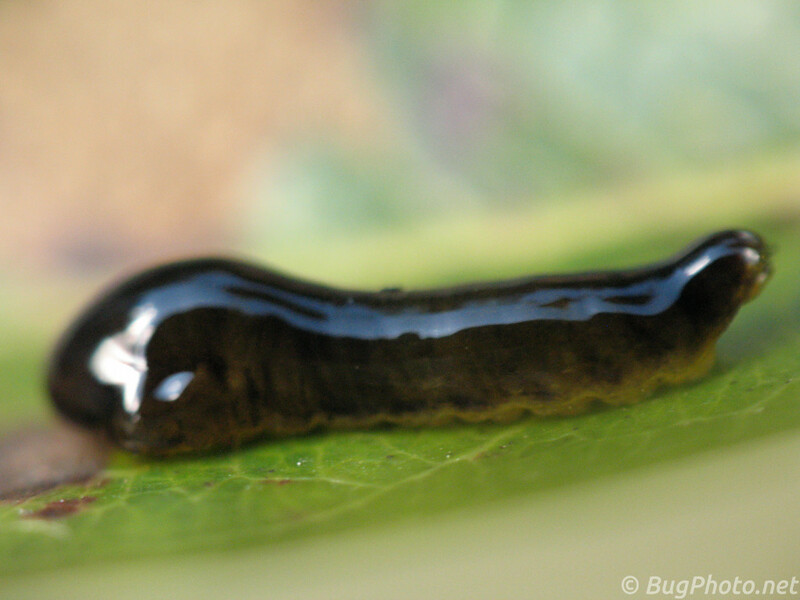 Our featured bug today, is the Pear Slug, the larval form of the sawfly Caliroa cerasi. It is an apt name for the slimy, shiny looking creature (the glare spot in the above photo is the sun reflecting off another individual), but if you look under its hood there is an insect noggin. 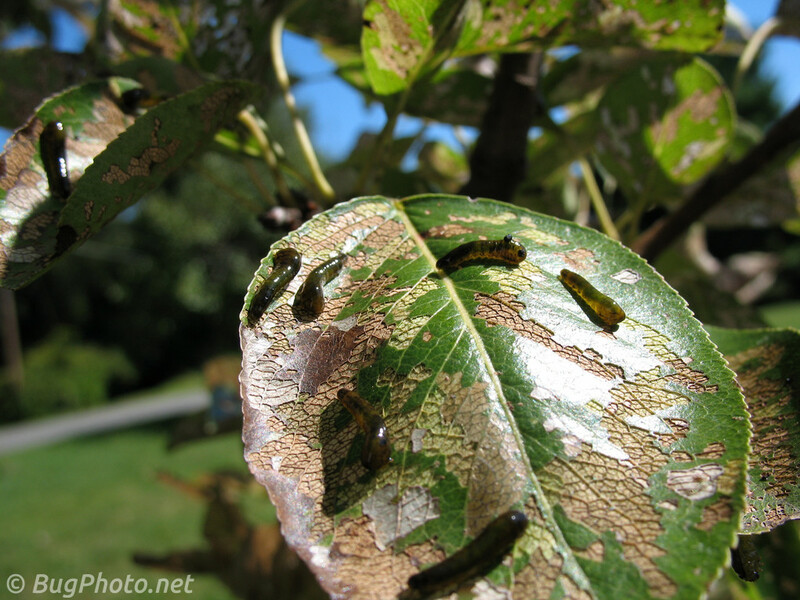 Quite often and easily, people confuse sawfly larvae for caterpillars (which of course are butterfly and moth larvae), but the pear slug doesn’t bring the warm and fuzzies to mind. While there are exceptions, one way to distinguish the more confusing specimens is to count the prolegs (i.e. 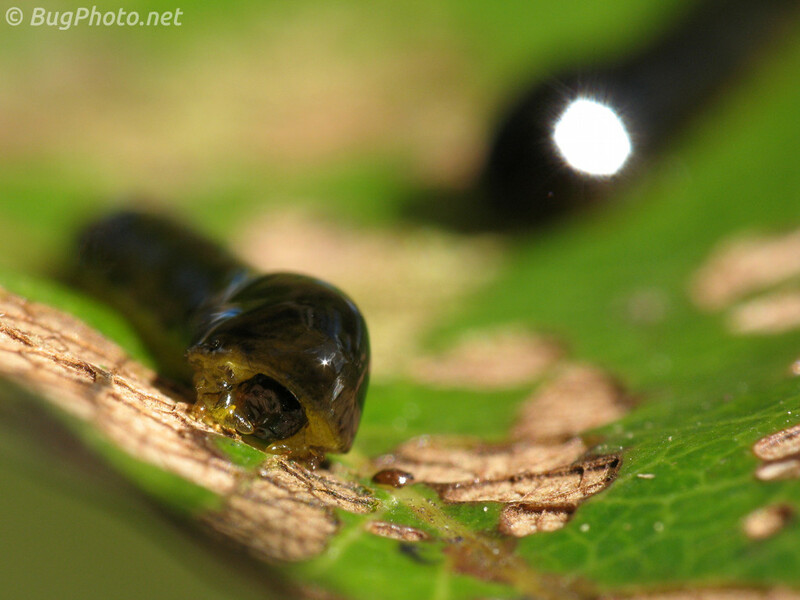 the suction cup-like appendages); caterpillars have 5 or less pairs, while sawfly larvae have 6 or more pairs. There are three pear trees in my yard, but pear slugs have only infested one of them the past three or four years. It is the smallest of the three trees, but it persists pretty well in spite of having to have supported a bunch of slugs. All these pictures are from two or three years ago, but you can see what the appetite of a big aggregate can do to otherwise beautifully green and healthy leaves, thoroughly eating the surface layer. Oddly enough, this past year around early autumn, when they tend to appear, I only found a single individual pear slug. The leaves were much greener on the tree this year! Posted in SawfliesTagged Caliroa cerasi, not a caterpillar, not a slug, pear slug, under the hoodBookmark the permalink.